Each year, the rugby union teams of South Africa (known as the Springboks), New Zealand, Australia and Argentina meet on a home and away basis to contest the renowned Rugby Championship. Formerly known as the Tri-Nations, until Argentina was invited to join in 2012, the Rugby Championship is the premier tournament for the Southern Hemisphere outside of the World Cup. In this article, we’re going to walk you through the history of the Championship and focus on some of the Springboks’ most memorable wins. The Tri-Nations was inaugurated in 1996 after South Africa was readmitted to the international scene. The tournament was dominated by New Zealand in its early years, with the All Blacks winning each of its first eight matches to claim the 1996 and 1997 titles. In 1998, however, South Africa emerged victorious, beating their rivals home and away to claim the title of Southern Hemisphere champions. Instead of establishing themselves as the dominant team in the competition, South Africa went through some barren years, finishing bottom of the rankings for five consecutive editions of the tournament. In 2004, however, they won the Tri-Nations for the second time in a tightly contested competition. Each side won twice, but South Africa’s attack managed three bonus points, which saw Jake White’s men lift the trophy. The Springboks easily won the World Cup in 2007 but found the Tri-Nations a struggle until 2009, when five wins in six matches, including a rare victory in New Zealand, allowed John Smit to raise the Tri-Nations trophy once again. 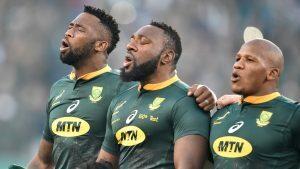 Since the Tri-Nations became the Rugby Championship, South Africa have failed to win again, with New Zealand being the dominant team in recent years.